We know that the church is a body, a united body of believers. The Holy Spirit ordains where each believer is to be and what gifts he is to have. He ordains where we are in the body so as to contribute to the good of the whole. It could be said that the Lord is painting a picture. If you’re familiar with the Impressionist movement of art that emerged in the late 1800s in Paris, then you’re familiar with the works of Monet, Manet, Sisley, Renoir, &amp; etc. These artists used short brush strokes to convey movement and impression, rather than precision. 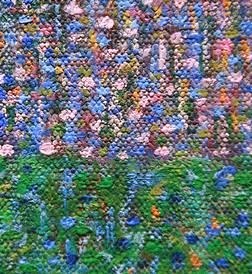 There was a sub-culture of the Impressionists called the Pointillists. 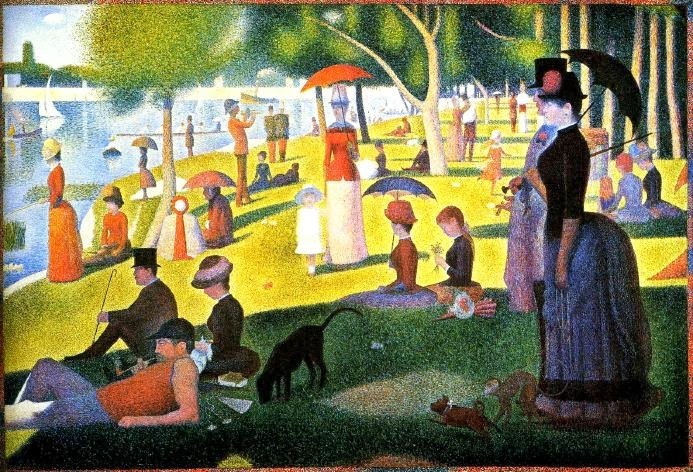 Here is Georges Seurat’s famous pointillist painting, “Sunday Afternoon on the Island of La Grande Jatte“. It could be said, that the earth is the canvas and the people are the points of paint God daubs precisely here and there, working toward an end. I’ve seen pointillist paintings at museums. You look very closely and all you can see are daubs of color. Dots. If you back away to a distance, you can see the scene clearly. It’s amazing how the colors blend to make a seamless and beautiful picture. We can think of ourselves as dots. We can’t see the whole picture, we don’t have the right perspective. God does. He puts a pink next to a blue and though all we can see is the blue next to us, we have to trust that the Great Artist is making something beautiful. Even if you don’t like the color pink, you know and trust that the Artist’s purposeful placement of it next to you will make the picture as a whole perfect when it is complete. I’ve heard of wine pairings, or even tea pairings, but book pairings?